Compared to some of the other nootropics suppliers in the field, ModaPharma is relatively young – having only been established in 2015. Yet, in just a few years, they have managed to quickly rise up and escape obscurity. Currently, they have served over 5,000 customers worldwide, and that number continues to grow by the day. This is thanks to several very customer-friendly features of their service, the most unique of which is their SureDelivery guarantee that provides complete protection for your shipment. Beyond that, they also provide large discounts for Bitcoin users, round-the-clock support, and, more importantly, third-party certifications for all of their products. It’s not a perfect service by any means, but the number of benefits outweigh the bad. Read on to find out more about ModaPharma! Certified Products: The products that ModaPharma carries have been tested and certified by third party labs – which means they are proven to be authentic and safe. Bitcoin Discount: Though they accept other payment methods, going with Bitcoin will give you a pretty sizable 15% discount. SureDelivery: Not only does ModaPharma offer free global shipping, they also protect your shipment with their SureDelivery guarantee – which provides shipment tracking, free re-ships, and even a money back guarantee. 24-hour Support: ModaPharma’s support can be reached at any time of the day and their support team are native English speakers that provide helpful replies. Lacks FAQs: ModaPharma’s website is littered with tons of information about their products and modafinils in general, but the lack of a centralized knowledgebase or FAQ section means you would have to comb every nook and cranny of their website to get information that would have been otherwise quickly addressed in a FAQ. Other Forms of Support: Although ModaPharma provides round-the-clock support, it is only via an online contact form – so don’t expect any live chat, direct email, or phone support here. There are countless sources on the internet that offer nootropics, but a good chunk of them are dubious at best. Most don’t even have proof that their products are legitimate so you risk buying fake nootropics if you are not careful. Nootropics are designed to boost your focus and cognition, so imagine the dangers of taking counterfeit ones that never passed through tests or certifications. The great thing about ModaPharma is that their products are guaranteed to be authentic and not cheap knockoffs. On their website, they provide a section dedicated to proving the authenticity of their modafinils. You can view certificates of analysis for each of their products, and you can see that each test was conducted fairly recently by a third party lab, if you are doubtful of their legitimacy. As if the certificates were not enough, ModaPharma also provides countless reviews from real customers so you can get a pretty good idea of what you are getting with each product. And that’s not all; each product page also features links to reviews from other websites, allowing you to be fully informed before making any decisions. Interestingly, for those that want to talk about ModaPharma and their products, you can get free samples just by sending them a link to your content. This should be a good way for bloggers to get a small taste of the company’s nootropics without shelling out much. In terms of shopping experience, ModaPharma doesn’t stray far from the “less is more” approach so you can breeze through their website with ease. Everything is neatly arranged and clutter is virtually non-existent. It also helps that their website looks and feels professional and is updated on a regular basis so you are confident that they do mean business and are not some shady fly-by-night nootropics supplier. Beyond that, ModaPharma also goes the extra mile when it comes to educating their customers about nootropics. Their website is filled to the brim with useful information about nootropics, and particularly about each of the products they offer. If you want to learn more about nootropics, modafinils, armodafinils, and the like, then ModaPharma can definitely help in this regard. Finally, ModaPharma’s website is also capable of switching to multiple languages, complete with dedicated stores for Australia, USA, UK, Germany, and even for the larger international community. ModaPharma offers 4 different products to choose from, namely: Modalert, Artvigil, Modvigil and Waklert. 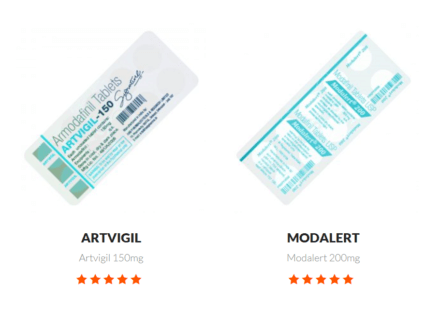 Modalert and Modvigil are generic versions of modafinil from Indian pharmaceutical companies; Artvigil and Waklert, meanwhile, are versions of armodafinil. These four brands are some of the most popular in the online nootropics market, so you’ve got a good selection here. What might be a deal breaker for some, however, is how limited their dosage options are. In fact, there are no other options besides what they give you. So, if you need, say, 100mg of Modalert and not 200mg, then you are out of luck as they only offer the latter. You can always cut pills in half as a workaround in this case, but having the option in the first place would have been better. What sets ModaPharma’s services from the rest is their customer-friendly SureDelivery guarantee. Just as the name suggests, this guarantees that your item is delivered to you no matter what – free of charge. It must be noted, however, that while they claim to deliver worldwide, the truth is that they ship to “nearly all countries.” There are some countries that they won’t be able to ship to, but they don’t disclose that in their website. Instead, you would have to contact them directly in order to find out which countries they can’t ship to. Meanwhile, you can also track your shipment in real time (via USPS) so you know what is happening with your package at any moment. If you don’t receive your order within 15 business days, then they will re-ship your item free of charge. In some cases, you can also receive a full refund. Of course, there are some exceptions to the rule. You won’t get free re-ships or full refunds if you: made a mistake with your address; failed to collect your package; or if your item has been sent back due to any of the previous two scenarios. Beyond SureDelivery, ModaPharma earns plus points for using discrete packaging on all of their shipments, so you need not worry about your privacy being foiled by overly conspicuous packaging. ModaPharma offers 24 hour support, but it is only accomplished via an online contact form. If you were hoping to resolve issues via live one-on-one support, then you are out of luck. Thankfully, their support team replies in a timely manner, so you won’t have to wait too long to get your issues sorted out. You can also get in touch with them via their Facebook, Twitter, Google+ and Reddit channels if you wish. Meanwhile, they seem to be lacking a dedicated FAQ section or knowledgebase, but, thankfully, they do litter their website with tons of helpful information about their products and nootropics in general, so just browsing their website will provide you nearly all the information that you need. What's the Verdict on ModaPharma? ModaPharma definitely has a lot going for them. The SureDelivery guarantee, Bitcoin discounts, and the legitimacy of their products are sure to win over skeptics. But, of course, like any other service out there, it isn’t a flawless. The variety of dosage options are a bit lacking compared to others, for instance. And while they offer 24 hour support and their team does their best to reply in a timely manner, live one-on-one support would have significantly elevated their service. Overall, however, you are still looking at one of the best online nootropics suppliers out there, especially because their products are certified by a third party lab, and the SureDelivery feature ensures you get your delivery no matter what. In short, ModaPharma is definitely worth checking out! I just purchased a few days ago and have not received confirmation for shipment. I’ve scoured their site and cannot get ahold of any form of customer service. I am super frustrated and disappointed. I think it must be a scam. Although, I’ve read posts on reddit where customers complain about the same issue and then got a response from modapharma. Not sure if I should just consider this a loss and purchase elsewhere. The reviews are definitely misleading. BUYER BEWARE! Total rip off! They know they can rip you off because it’s a international purchase, and the Consumer Protection, Attorney General, Banks… can touch them! They are outright crooks and stole mine, and I’m sure a lot of other people’s money!!! I went to make a purchase, and filled out the credit card info. only to be directed to “CoinMama” bitcoin merchant web site to AGAIN fill out credit card info. Coin Mama charged a 5% fee, PLUS a 6.15% additional fee for processing credit cards, something that was suppose to be done on modapharma’s web site. I attempted to email their so-called support via their web site, but was not able to send the actual message (kept locking up). I got creative and sent it through “support@modapharma.com. The next day I got a reply that basically it was okay to order through coinmama and I wouldn’t be billed twice. Even though I would have to pay an additional 11.15% for something most merchants don’t charge, I did it anyway. BIG MISTAKE. They not only double billed me, I never received an order confirmation, and when I went to email them several times on the status of my order, no reply. My bank can not stop, reverse, refund, dispute…. the charges, because…. yep, international purchase! Also; all their “positive reviews” are employee generated! In my experience I have found the Customer Support section of this review to be categorically false. I have paid ModaPharma for a product via Bitcoin and my order was then cancelled on their end. I have tried contacting them via email, Facebook and even created a topic on their Reddit, to no avail or response. Easily the worst online shopping experience I have ever had.